We are very excited to bring you another awesome giveaway and help announce the 2016 Fall Green Scene Mom Award Winners, hosted by Mommy Scene and celebrating Eco-friendly product design and creative innovation. Award winning products include natural body products, universal baby gear, essentials for moms, and items for solving problems and making family life with kids easier. 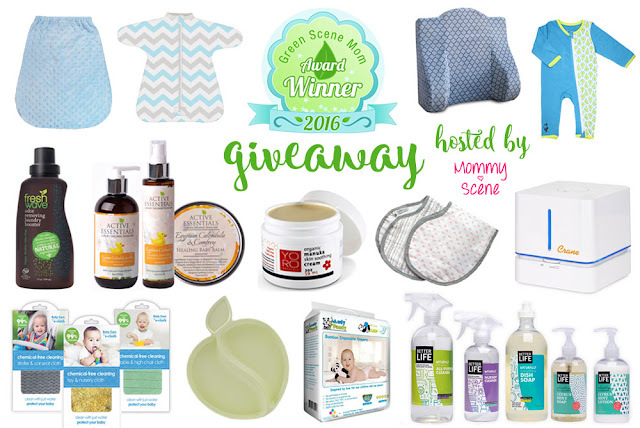 Enter to win a fabulous collection of prizes! Open to US entries and ends 11/20/16. My favorite fall memories are taking walks in the park to see all of the beautiful color changing leaves falling & carving pumpkins with the family. favorite fall memories are going for a hike in the woods and enjoying the fall colors, spotting all the wild animals, spotting birds etc. We have family football games with the whole family. we love going to the pumpkin patch and carving pumpkins! Making wreaths out of dry leaves. Love the different shades of fall! Favorite Fall Memory was taking a walk in the park and sitting down for a drink and just talking. Enjoyed the company and all the kids running around having fun.